Penticton, BC: The Penticton Vees are extremely proud to announce defenceman Jonny Tychonick has been named to Team Canada for the World Under-18 Championships in Chelyabinsk and Magnitogorsk, Russia, April 19-29. 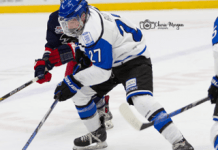 Tychonick, from Calgary, Alberta, wrapped up his second season with the Vees by recording nine goals and 38 assists in 48 games, doubling his offensive production from his rookie season when he scored three times with 20 assists in 48 games. Tychonick took his game to another level in the post season, scoring three goals with 14 assists in just 11 games. He recorded at least one point in every single game during the 2018 Fred Page Cup playoffs. He also represented Canada on the International level earlier this season, being named an alternate captain for Team Canada West at the World Junior ‘A’ Challenge in Truro, Nova Scotia. There, Tychonick scored a goal and an assist to help Canada West take home gold. The 5’11’’ rearguard has been on NHL draft radars all season long, coming in at 45th amongst North American skaters in the most recent NHL Central Scouting list. Tychonick becomes just the sixth CJHL player since 2002 to play for Canada at the World Under-18 Championship, with three of those six being Penticton Vees after Tyson Jost and Dante Fabbro in 2016.